Just 10,253 fans attended Adelaide’s Hindmarsh Stadium on Thursday evening for the launch of AFLX, the seven-a-side and highly-altered form of Australian Rules football that will run over three consecutive nights. Six AFL teams will play on each evening in a round-robin format, with Adelaide winning the first ever ‘grand final’ by eight points against Geelong. But the countless modifications to rules, severely depleted teams and peculiar atmosphere – which saw music played during matches and commentary broadcast over the venue’s PA system – did not go down well with the majority of fans. Most of the seven 20-minute matches were devoid of big marks and contests between players, resulting in a fast and free-flowing product that resembled basketball at times. The quality of the stadium’s surface was also poor, while the AFL was forced to change the balls from silver to yellow to help fans and television viewers see the ball better. Cricket hero Shane Warne shared a similar thought. As an #AFL football lover – my first impressions of #AFLX is yep it’s fast & not bad, but looks a bit to much like a training drill for me ! Let’s see next few games, go Saints ! Others were far more critical but those inside the AFL bubble remained positive. Adelaide player Harry Dear told the Seven Network “it was tricky to get a grip of” but added “it was exciting”, while teammate Jake Kelly said he struggled to hear his teammates during matches because of the music being played but that he enjoyed the contest. Geelong started Thursday night’s proceedings with a 12-point victory over Port Adelaide, a clash in which Zac Guthrie made history as the first goalkicker in AFLX. Riley Bonner replied for the Power with the first ‘Zooper Goal’ – 10 points were given to goals kicked outside the 40m arc – but the Cats had the last laugh. Adelaide, which played a youthful side all evening, then proved far too good for Collingwood before Geelong won again, this time against Fremantle. 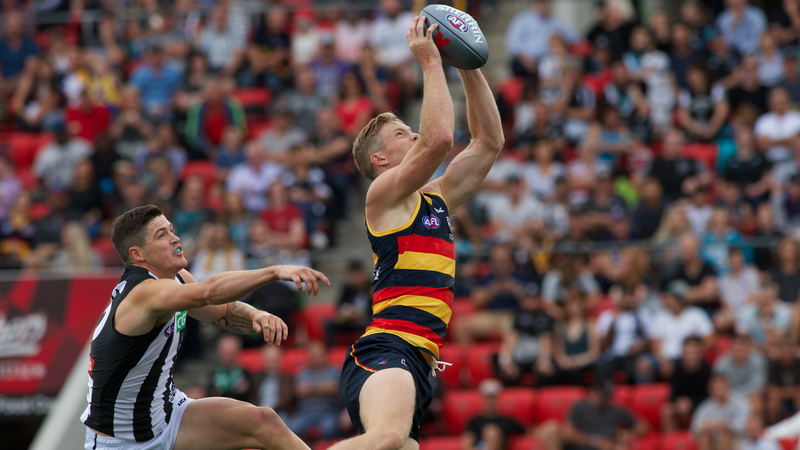 Adelaide’s clash with West Coast was probably the highlight of the evening – the Crows won a close encounter by seven points – before Fremantle and Collingwood emerged victorious in dead rubbers. Don Pyke’s Crows burst out of the blocks in the final, with ‘Zooper Goals’ to Patrick Wilson and Tom Doedee giving them a 20-point lead inside the first minute. The Cats, playing a strong side that included the likes of Mitch Duncan and Tom Hawkins, battled hard from there but never hit the lead as Adelaide held on for victory. AFLX is played on a rectangular field (approximately 70m width x 110m length) with four posts at each end (as per a normal AFL field). Ground markings will showcase X as the centre square and 40m arcs. Two field umpires, two boundary umpires and one goal umpire at each end of the ground. Ten players per team, seven on field at all times and three on the interchange bench. No restrictions on player rotations. 10-minute quarters or halves depending on the tournament format. Free kick against for last touch out of bounds. Kick-ins from behind the goal line after all scorers. No marks paid for backwards kicks (except in forward 40m area). Quarters commence with a ‘ball up’ in the centre and at least two players from each team starting inside the 40m arc. Free shot from forward 40m arc, directly in front, for deliberate rushed behinds. Each AFL side will play a minimum of two AFLX matches.